Set in 1959 in Miami, Magic City tells a kind of multicultural crime drama story about organized crime seeking to do to Miami what they did to Havana before the rise of Fidel Castro. While arming rebels seeking to over though Castro so the mob can retake their lucrative casino businesses back in Cuba, Ben " The Butcher" Diamond (Danny Huston) seeks to do to Miami what Bugsy Siegel accomplished with the creation of Las Vegas in an attempt to not only expand his criminal empire, but create a name for himself that will live in history books. Ike Evans (Jeffrey Dean Morgan) seeks to rid his Miramar Playa Hotel of Diamond, who has his eyes upon it. Ike attempts to do so by luring Diamond back to Havana under the idea that Castro won't care who is running the casinos so long as the mob hides their presence from the public. Ike knows that Castro will need the casinos to rebuild tourism from countries friendly with Cuba's new government. In attempting this however, Ike brings himself face to face with new and more dangerous criminal organizations based as far away as Chicago while some are as close as the inner-city of Miami. All of these developments occur across a backdrop of Ike's sons' drifting loyalties to concerns on opposite sides of the law, but none on Ike's side. Meanwhile his wife (Olga Kurylenko) falls into drug addiction as she attempts to bring back her glory days as a professional dancer and potential draw to the hotel to help bail Ike out of mounting debts. Major guest stars for the second season include James Caan, Esai Morales, rapper Rick Ross, and Sherilyn Fenn. Magic City is a glossy yet gritty series that captures an era long gone, but not forgotten with characters that are broadly drawn to appear more epic and tragic than the run of the mill crime drama. The series has an elegance to it and an attention to period detail. Anchor Bay Entertainment's Blu-ray Disc set beautifully capture every visual and audio nuance in glorious (1.78:1) widescreen 1080p/24fps high definition with an English Dolby TrueHD 5.1 Surround Soundtrack. A Spanish Language Mono Soundtrack as well as English Subtitles for the Deaf and Hearing Impaired and Spanish Language Subtitles are encoded onto the first two Blu-ray Discs for all eight season two episodes. English Subtitles for the Deaf and Hearing Impaired are also provided for the bonus features presented in full 1080p/24fps high definition on the third Blu-ray Disc. The featurettes on disc three cover the historical context as it relates to the characters in the backdrop of The Gamble For Havana (3:05), The Criminal Element (4:47) and explores the roles of guest stars James Caan and Rick Ross in Tales From The Underbelly (4:58). A costume design featurette focusing how the actors collaborate with the costume designer to make their wardrobe be a part of their character's development and a reflection of their personality within the era in which the series takes place (1:52). A short on the selection of the series soundtrack music, which is a mix of period and subject appropriate contemporary music as it relates to the closing montages and more wraps up the bonus features on disc three (5:52). Trailers for The White Queen and DaVinci's Demons precede the interactive menus on disc one. The interactive menus on all three discs are elegantly rendered and easy to navigate. The three Blu-ray Discs come housed in a digipack style gatefold with a cardboard slip. The series is also available on DVD, but sold separately. 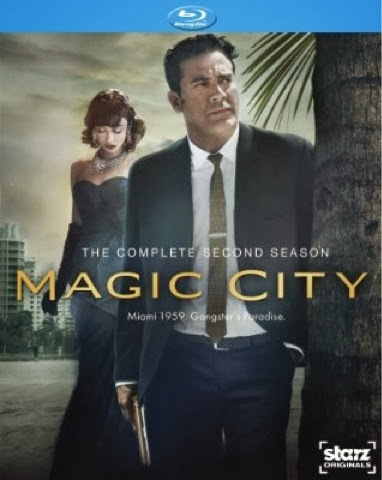 Magic City: The Complete Second Season on Blu-ray Disc is available as of November 5, 2013 at retailers on and offline courtesy of Anchor Bay Entertainment.